Place dry ingredients in large bowl. Make a well in the center. 2 1/2" high. Flatten so that each log is 6" to 7" wide by 1" high. Place on non-stick baking sheets or lightly greased ones. Bake 30 - 40 minutes. Remove and cool for 10 minutes. Slice into 1/2" - 3/4" slices. Place on baking sheets and bake for about 20 minutes or until golden brown. Cool. 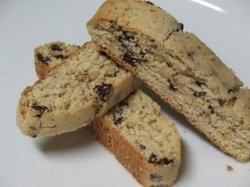 If you are *extra* fancy, melt the remaining 1/2 cups of carob chip and drizzle over biscotti. Refridgerate to set carob.